3 days on a boat in the Mekong Delta and a whirlwind 2 days in Saigon have conspired to keep me from updating, but fear not, we’re back in business here in Cambodia. 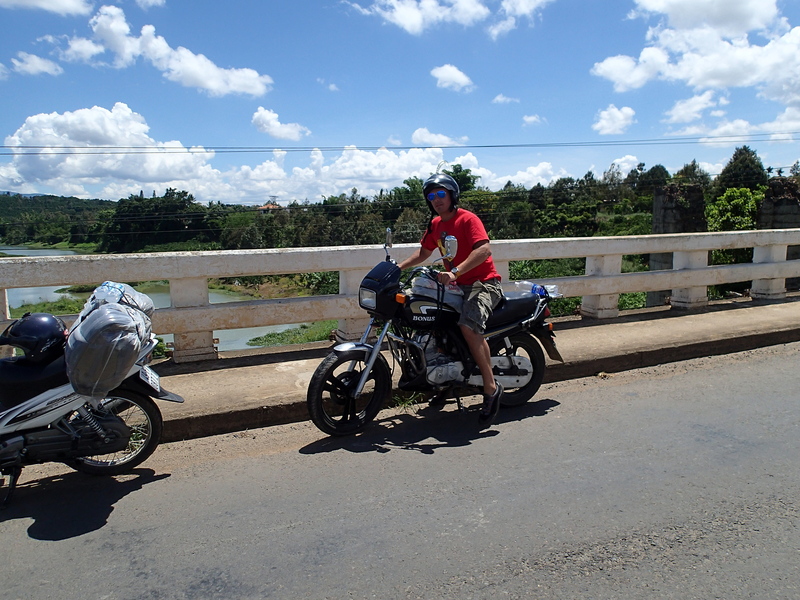 After a successful day biking around Da Lat, I decided that I’d rather spend 8 hours on a motorcycle than 12 on a “sleeper” bus, so I hired Hero Hung again to take me down to Saigon. 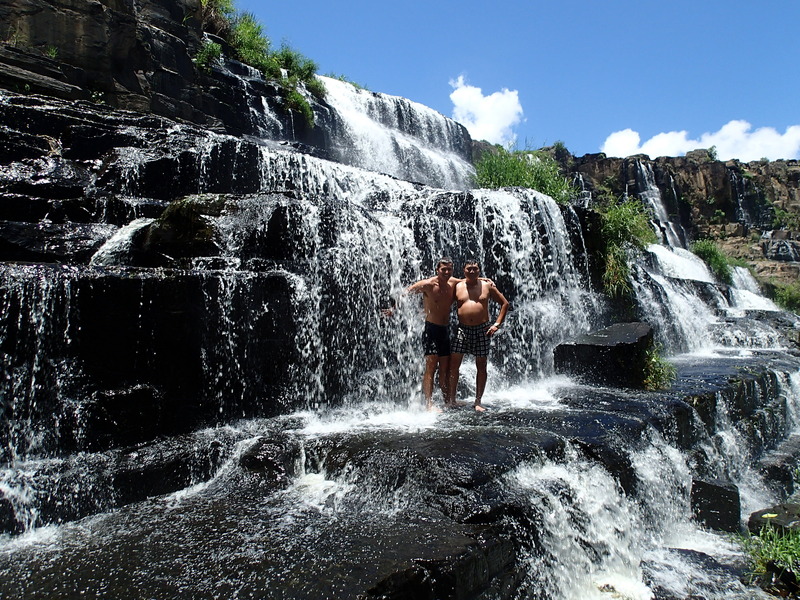 It was a bit more business than the last trip, with us needing to make some serious time, but I did spend some time in the gorgeous Elephant Falls. No near drownings to report this time thankfully. After getting to Saigon, it was obvious that the end of Vietnam was going to be very different than the beginning. Saigon had all the hustle and bustle of Hanoi, but there was a distinctly Western feel to it. There were wide treelined boulevards, and while Notre Dame Cathedral wasn’t rivaling much in Europe, it was beating the pants off of the seats of several American archdiocese. KFC, Subway, McDonalds and Starbucks were present and plentiful, as were billboards for Heineken and more. There is a ton of history to be seen in Saigon though, and I got right to it with the War Remembrance Museum. To call the place gut wrenching really didn’t do it justice. While I haven’t really felt like I’ve been looked at funny as an American in Vietnam, there was definitely a different tone to the War Museum. Downed American aircraft stood next to disabled American tanks, all leading into an open plan museum, the first floor of which was dedicated to the international outcry against the war. Obviously being prior to my lifetime, I’m not sure what tone the protests against the war took either within the US or abroad, but prominently displayed were the letters from Ho to Harry Truman, and that did cause me to hang my head. The next 3 floors were dedicated to the atrocity that is war. There were large exhibits to the My Lai massacre and others, but the worst was the Agent Orange exhibit. The amount of toxic defoliant that Americans dumped was absolutely astounding. The consequences of that are still being felt today, but for 2 decades after the war, the destruction of fertile land forced Vietnam to import rice until the mid 1990s. It is now the world’s number two exporter of both rice and coffee. Even worse was the horrible effects it had on the population, both in terms of immediate and delayed death. Then there were the myriad birth defects that were caused over the next 2 generations of Vietnamese people. I wondered when we were in the big cities why there seemed to be such a higher prevalence of spina bifida. That is one of the known birth defects caused by exposure to Agent Orange. Doesn’t matter what side of the political fence a person is on, chemical warfare is as horrific a tactic as humans have ever used on one another. The unintended consequences are far more costly than any strategic gains are worth. In light of chemical weapons being used once again in Syria, I really hope that people take a little time to think about the results of such weapons, and again re-affirm our opposition to chemical warfare of any kind. Agent Orange also played a role in my history lesson the next day, when I tore off through the jungle to the Cu Chi tunnels. In response to the aggressive deforestation campaign waged to flush out the Viet Cong, the citizens/fighters of the Cu Chi area dug an impressive network of tunnels in the area connecting with the nearby Mekong River. The Cu Chi tunnel system ran an impressive 150 miles underground, with tunnels reaching as deep as 60 feet. Seeing these tunnels really put in perspective the lengths that people were willing to go in this war. 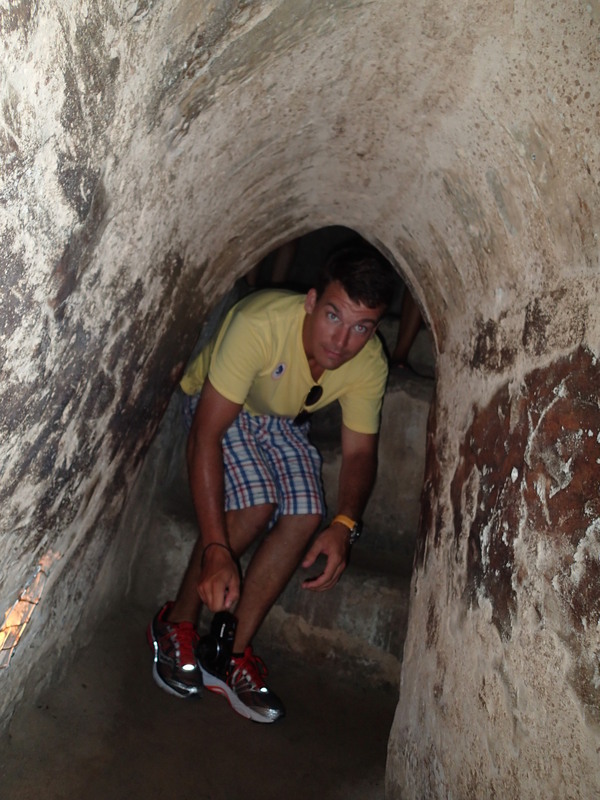 I cannot imagine spending days underground in tunnels so narrow that I could barely square my shoulders. I’m not normally very claustrophobic, but between the tunnels and the oppressive heat, I was on the verge of a real freak out about 30 meters into the 60 meter stretch that I went through. Took several deep breaths to get me back calm enough to work my way back out. The traps used by the “rebels” in the Cu Chi area were rudimentary and absolutely vicious. Most were bamboo spike based booby traps and all were unbelievably painful to whomever fell into them. The butchery of war seems endless with the myriad ways that man has come up with to kill his fellow man. Any country with a history long enough will have dark marks that won’t come off. The stains on the soul of America started with Vietnam. The past can’t be changed, but it can be learned from, and I sincerely hope that those who go into public service in the US take the time to review the failures of past generations. These are mistakes that we can’t afford to replicate generation after generation. As I write, there are the embers of war being fanned all over SE Asia and indeed the world. From the Sino-Vietnamese conflict brewing, to the military coup in Thailand, and Russia’s annexation of Ukraine, the seeds of outright conflict are finding fertile soil. This is to say nothing of the brutal civil war which has been waged in Syria for nearly 3 years. Any of these conflicts can spiral out of control in a matter of days. The US has found itself either unable or unwilling to put together a cohesive foreign policy, and this has allowed conflict to spring up in places which have long known peace under the US hegemony. I hope that my country realizes its responsibility to peace, and finds a way to once again deter the aggression of neighbors before the bombs start falling. I’ve finally seen a war zone up close and it is all the hell that the bards ever claimed.